Two interim titles are on the line this coming Sunday (Apr. 14 AEDT) when Ultimate Fighting Championship visits Atlanta, GA with UFC 236. MMA event takes place at the State Farm Arena featuring the 13-fight bill on PPV. 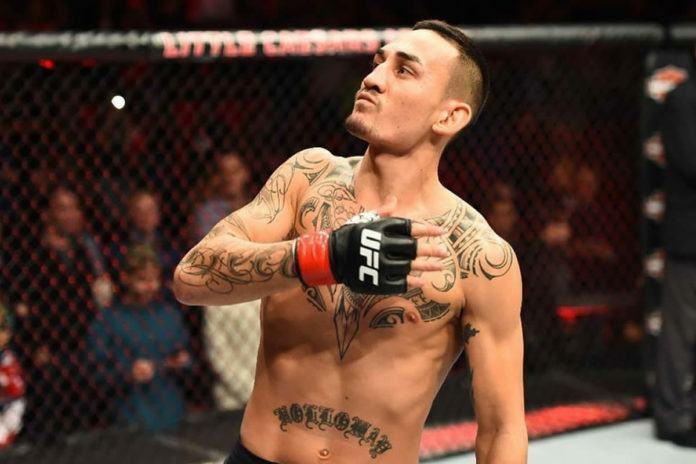 In the main event Max Holloway and Dustin Poirier square off for the second time. The pair battles it out for UFC interim lightweight title. The winner is expected to face the reigning champion Khabib Nurmagomedov at the future event in the championship unification. In the co-main event Kelvin Gastelum meets Israel Adesanya contesting for UFC interim middleweight belt. The current champion Robert Whittaker is also expected to face the winner of this bout in future. The main card also includes a light heavyweight battle between Eryk Anders and Khalil Rountree Jr. In addition Alan Jouban takes on Dwight Grant at welterweight, and Ovince Saint Preux goes up against Nikita Krylov at light heavyweight. The five-fight main card follows the four-fight preliminary card. MMA action begins with the early preliminary card also comprising four bouts. The official weigh-in ceremony is conducted a day before the fight show. The complete UFC 236 fight card can be found below.